Why does Deadpool wear a skin-tight jumpsuit? After all, it sort of looks like a pair of red and black pajamas. It’s simple really. The most obvious reason for his apparel choice is that it looks flippin’ amazing on him. The other reason might not be so obvious. You see, Deadpool has to face all sorts of bad guys in his daily activities. One second he has to engage in fisticuffs with Black Tom Cassidy and the next second he’s getting attacked by zombie versions of the Presidents of the United States (not the band). He needs FULL range of his motions. He can’t exactly do a backflip with ease wearing heavy armor like Cable. He also doesn’t really need a full suit of armor to protect him from injury, since his mutant healing factor makes that unnecessary. That’s why he needs to wear something light, so he can remain agile, even in the heat of combat! 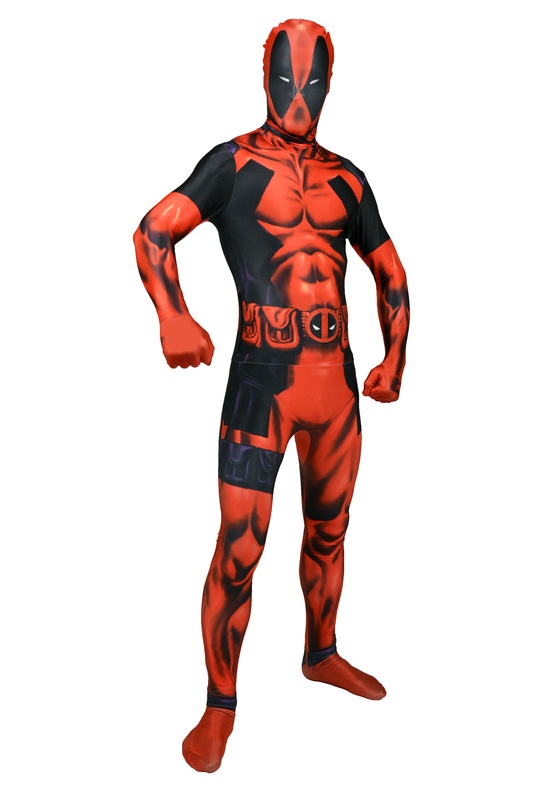 Well, we don’t recommend engaging in any fights with supervillains in this Deadpool Morphsuit, but you will remain highly agile when you wear it. It has the classic red and black design, as seen in the X-Men and X-Factor comic books. The front even has printed pecs and ab muscles, so you can look like one buff mutant, even if you don’t want to make trips to the gym. It also has a printed utility belt around the waist, which makes you look prepared for any kind of throw down that you might encounter while wearing this costume. Make sure to practice your superhero moves before slipping into this adult Deadpool outfit! After all, you might feel like trying out a few ninja moves when you have it on. You also might want to check out some of our toy weapons, since we all know that Deadpool likes to take a pair of katana with him everywhere he goes.